This event has been postponed and will now be held in Long Beach on a date TBA. We'll update the story again when we have more info. 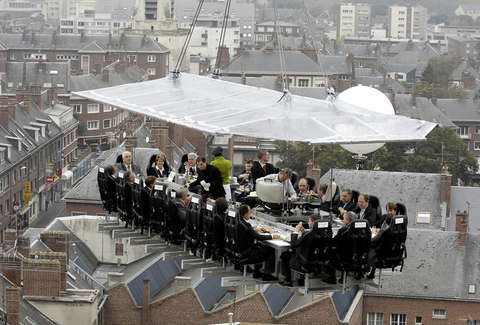 You've probably heard about Dinner in the Sky -- the insane dinner series where a crane will suspend diners 150ft above street level -- but haven't you wondered what people will actually eat during it? First course: Gold potato & fennel vichyssoise with toasted chili pecans and broken basil oil. Second course: Warm pear tart & Humboldt Fog goat cheese with Cheven's Prosciutto de Canard, Scarborough Farms teenie greens, and roasted raspberry Champagne verjus. Third course: Choice of sous vide beef cheek with parsnip cake, English pea flan, and truffle demi or chicken confit "pot-pie" with farmers market vegetables and Tuscan kale chips or the veggie foraged mushroom Wellington, with roasted tomato and porcini emulsion, charred baby elote and rocket arugula bouquet with warm sherry vin. Fourth course: Dessert trio: yuzu panna cotta with black pepper blueberry espuma, frozen cinnamon meringues and orange ganache, and chocolate mousse and minted soil. In addition, guests spending extra for VIP will also get tray-passed apps pre-flight (including poached ginger prawns, chicken and mushroom filo, and buffalo mozzarella and heirloom tomato pipettes), and an extra course of either scallops on the half shell or roasted rainbow cauliflower. Jeff Miller asked what happens if you need to pee and the answer was basically "hold it," so hell no. He's on Instagram at @jeffmillerla and Twitter at @ThrillistLA.